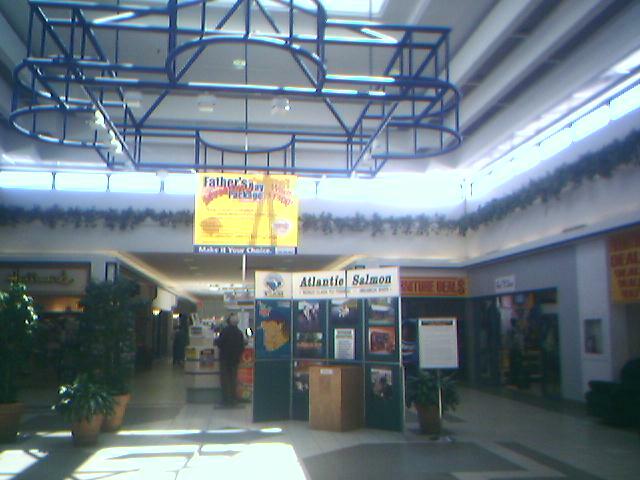 Constructed in 1971 as Fredericton, New Brunswick’s first enclosed shopping mall, the Fredericton Mall is located at routes 8, 101, and Prospect Street on the city’s south side in the center of the city’s major retail district. While only 221,000 square feet in size, the long, slender mall hosts approximately 60 stores, most catering to relatively utilitarian needs. 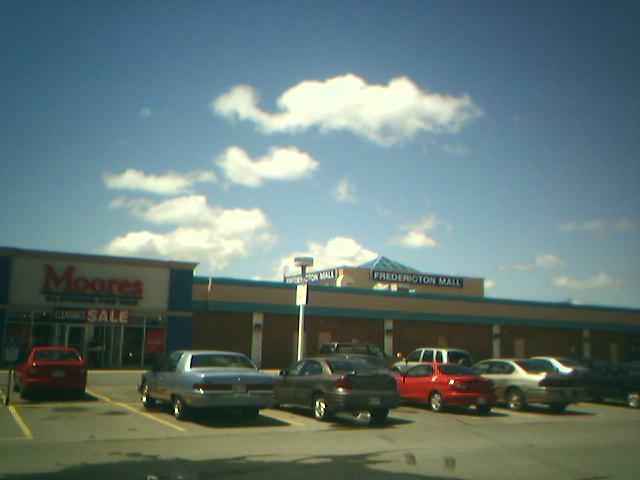 With Zeller’s, Sobey’s, Staples, and Shoppers Drug Mart as some of the anchors, it’s the kind of small mall that’s common throughout Canada. 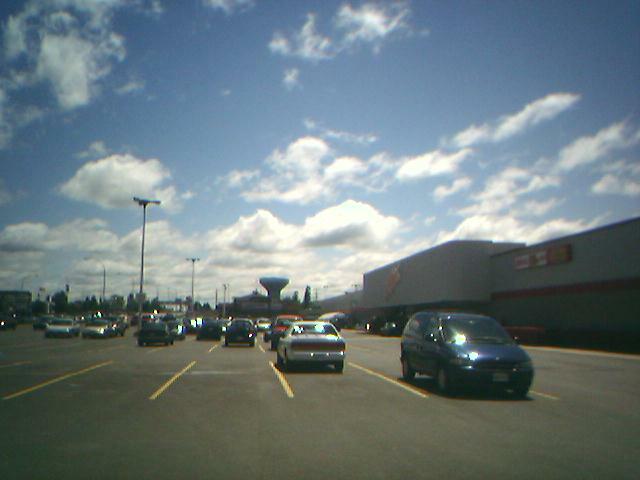 While Fredericton Mall was supplanted as the dominant mall for the Fredericton area in 1976 when the Regent Mall was built across the freeway, it continued to do relatively well until our visit in June 2005, hosting much of the overflow from its larger sibling. All photos here were taken on that June 2005 visit on the crappy VGA camera phone. Unfortunately, in the year since, Fredericton Mall has experienced some heavy changes and much of the mall is now being demolished and big-boxed. 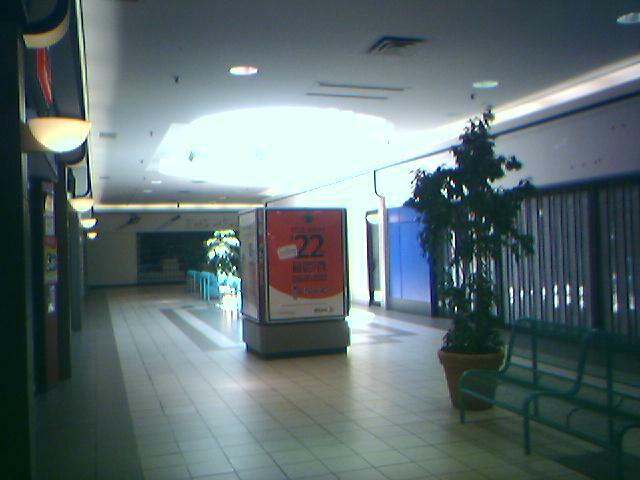 Sadly, the Fredericton Mall’s days as an enclosed mall have come to an unceremonious end. Also, a special thanks to Labelscar friend and poster JP Kirby for giving us some great information on this and other New Brunswick Malls! It’s hard to find much background on a lot of the centers up there. A slight correction to start: Fredericton Mall definitely held its own through the late 1970s and 1980s. It wasn’t until the big expansion at Regent Mall in 1990 that made it the kingpin of Fredericton retail. In the 80s, the major chains were more or less split between Fredericton and Regent, but entirely gravitated towards Regent in the 90s. 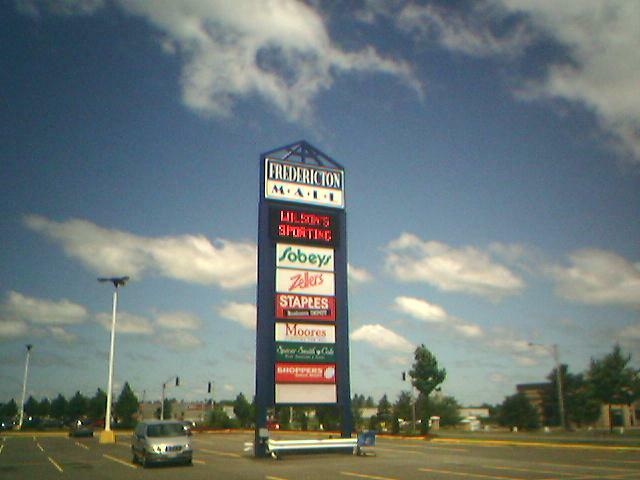 The mall is owned by Crombie Properties, a subsidiary of the Sobey family company. Some anchor history: As far as I can tell, Zellers and Sobeys have been at either end of the mall since day one, though both have been renovated and expanded multiple times. The middle anchor used to be The Met (a Woolworth-style low-end discount chain) until 1989 or so. 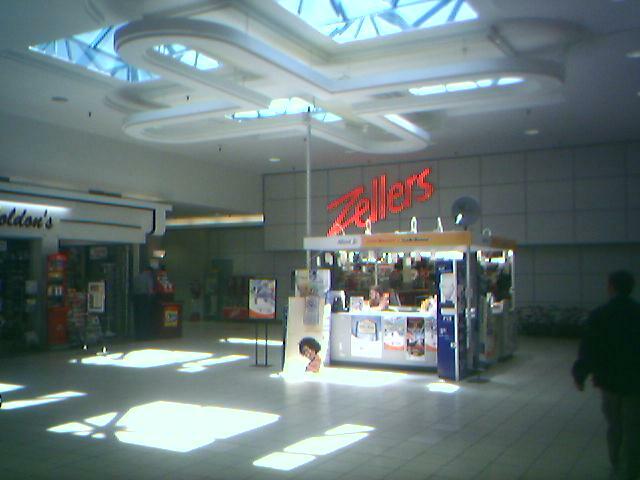 It was converted into a food court which didn’t really pan out, so Staples came to the mall in 1997. Another confirmed tenant is the New Brunswick Liquor Corporation (the government-owned liquor store monopoly), which is moving from an outlot building. This is actually a move back to the mall for NBLC, which used to have an in-line store until the mid-80s. I see something like this happening to most of the small-to-mid-sized malls in Canada, or at least the Maritimes. It’s already happened at Moncton Mall in, well, Moncton, and Fundy Trail Mall in Truro NS, to name two off the top of my head. At least it’s better than a mass-conversion to call centres. Came across your site on a random search for Fredericton blogs. I don’t know about anyone else but I’m heartbroken about what has happened to this mall in the last ten years or so. I went to high school across the street from the mall for 3 years, almost of all of which were spent walking the halls of the mall during lunch hour. I miss the stores, I miss the food court and I’m sad to see it all go. @April, I agree. I feel the same way. I spent many lunch hours there. I think that it helped the businesses to have so many young people there. Other shoppers seemed to be annoyed that it took a long time to get through the checkouts. I think that they must have made complaints about “the kids” that were hanging out. The store managers wanted to keep their adult shoppers happy. How would they accomplish this? It has to be said that some people stole from the stores. The store managers seemed to get upset at all of the teens. It made many of the kids that I hung out with (myself included) feel bad. The teens seemed to stop going. I know that I did. I have never ever stolen, but having people follow us made us feel accused and the stores lost out. Who in their right mind would want to go to stores where they felt second class? Regent Mall seemed to win as my choice. Many stores had moved in, and it was more convenient. They didn’t treat me any differently than how they treated any other customer. It impressed me. I still shop there. Minor update: NBLC has long since moved in next to Sobeys, and the portion between Staples and Pets Unlimited has been completely levelled, as has the former liquor store outlot building. No word on what, if anything, will occupy those spots. An even more minor update: the local rag reported over the weekend that Staples will occupy the space presently being torn down, and the existing Staples “bulge” will then meet the wrecking ball. I beleive the old Liquor Store cite is going to be a Royal Bank of Canada with drive thru. The de-malling has been complete for several months, and the Uptown Centre name is official. Staples has moved into its new location, while what’s left of the former Staples is about to become a Mark’s Work Wearhouse. Next door, an Urban Planet is under construction. The only stores from the old mall which made the transition to the new one are Zellers, Sobeys, Staples, Reitmans and Moores mens wear. Music World moved into its new digs last year only to see the whole chain go bankrupt 2 months later. The Uptown Centre is not fully leased as of yet – 4 stores are vacant, one of which is the former Music World. The outlot buildings are complete, with Royal Bank and Rogers Wireless going into the former NBLC building. Was at this mall several times in the past week. Seems that the resdesign was really poorly planned as nothing fits together all that great. One correction on the pop. estimates for F’ton and Saint John. The large student populations that move to F’ton for the majority of the year are usually not quoted(up to 7-10,000) or the towns and cities outside the city centre’s. A lot of people come from Oromocto to shop in town, thats 10,000 or so plus I see a lot of base personnel from CFB Gagetown shop. the F’ton area serves maybe 80-90,000 people. One interesting hing too is the former business’s in the old F’ton mall went too. The former bridal store in the old Coffee Mill has relocated back to Keswick Ridge where the owner is. The popular Coffee Mill moved out a number of years ago just down the road to prospect and smythe. Avalon/Artworld has a store down in Kings Place and another one in the old bens’s trophies bldg. on Gibson on the northside. This is the first I’ve ever heard of there being an Eaton’s in the mall – or in Fredericton, period. I’m guessing if it’s true, it was the middle anchor since Zellers and Sobeys were still listed. Can anyone else confirm? @JP, no there was never an eatons in the mall. Great hangout in the late seventys use to ski-doo up to the back, had fires out in the back , remember the swamp and the horseshoe in the corbett, old woods road, old hang outs , johnny fisher and his 1977 moto-ski sonic, greg thorton and his can-ams and kawasaki invader 440. jenine graham and carol freeman “the munchkins” use to hang out in my 78 olds 98, and 73 cutlass s, goodtimes. As an update since I used to live here and the last update was in 2011. Some additional renovation was done to Marks Work Warehouse, Sobeys and NB Liquor, mostly it seems to fix the facades so they look more intentional and more directly connect Sobeys and the NB Liquor (whom I believe Sobey’s may have been operating, which makes sense because Empire owns the mall and also owns Sobeys). Zellers shut down and sold most of their properties to Target to form their ill-fated Target Canada venture (although across the river in West Saint John the Zellers became a small Walmart that saved that mall). So Zellers renovated, sold to Target, liquidated, was renovated again to be a Target, went under and liquidated again. The Starbucks that was in the new Target was successful enough to prompt a corporate Starbucks to be built connected to the Shoppers detached building. Despite a lot of renovation that happened (the Target was actually really nice inside), no anchor has taken over the lease for that large segment. It’s occasionally operated as a flea market now.